Williamson County is part of the Austin-Round Rock, Texas Metropolitan Statistical Area. It was included with Austin in the Best Cities to Live in for 2009 by the Milken Institute It is on both the Edwards Plateau to the west, rocky terrain and hills, and Texas Blackland Prairies in the east, rich, fertile farming land. The two areas are roughly bisected by Interstate 35. 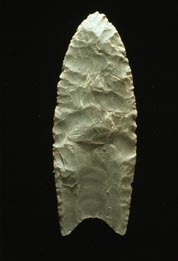 This Clovis point is from a period of habitation of approximately 11,200 years ago. Much of Williamson County has been the site of human habitation for at least 11,200 years. The earliest known inhabitants of the area lived during the late Pleistocene (Ice Age), and are linked to the Clovis culture around 9,200 BC based on evidence found at Bell County's much-studied Gault Site. One of the most important discoveries in recent times is the ancient skeletal remains dubbed "The Leanderthal Lady" because of its age and proximity to Leander, Texas. It was discovered by accident by the Texas Department of Transportation workers while drilling core samples for a new highway. The site has been extensively studied for many years, and samples from this site carbon date to the Pleistocene period around 10,500 years ago (8,500 BC). Prehistoric and Archaic "open occupation" campsites are also found throughout the county along streams and other water sources, including Brushy Creek in Round Rock and the San Gabriel River in Georgetown. Such evidence of Archaic-period inhabitants is often in the form of relics and flint tools recovered from burned rock middens. Many such sites were inundated when the San Gabriel River was dammed to create Lake Granger. The earliest known historical Native American occupants, the Tonkawa, were a flint-working, hunting people who followed the buffalo on foot and periodically set fire to the prairie to aid them in their hunts. During the 18th century, they made the transition to a horse culture and used firearms to a limited extent. After they were crowded out by white settlement, the Comanches continued to raid settlements in the county until the 1860s. Also, small numbers of Kiowa, Yojuane, Tawakoni, and Mayeye Indians apparently wereliving in the county at the time of the earliest Anglo settlements. On September 9 and 10, 1921, the remnants of a hurricane moved over Williamson County. The center of the storm became stationary over Thrall, a small farming town in eastern Williamson County, dropping a storm total of 39.7 inches (1,010 mm) of rain in 36 hours. The 24-hour rainfall total ending 7 am on September 10, 1921 (38.2 inches [970 mm]) at a U.S. Weather Bureau station in Thrall remains the national official 24-hour rainfall record. Thrall's rainfall was 23.4 in (590 mm) during 6 hours, 31.8 in (810 mm) during 12 hours, and 36.4 in (920 mm) during 18 hours. Eighty-seven people drowned in and near Taylor, and 93 in Williamson County. This storm caused the most deadly floods in Texas, with a total of 215 fatalities. On May 27, 1997, Williamson County was hit by the worst tornado outbreak in county history. The 1997 Central Texas Tornado Outbreak caused 20 tornadoes including an F-5 (the strongest rating used for tornadoes on the Fujita scale), which remains the only F-5 to strike Williamson County. The F-5 tornado killed 27 people and completely destroyed the Double Creek Estates neighborhood in the city of Jarrell, Texas, located in far northern Williamson County. Another strong tornado, an F-3, struck the Cedar Park, killing one person. Two F-2 tornadoes also struck Williamson County. The outbreak cost the county over $190 million in damages and a total of 30 fatalities. Williamson County's fast growth rate is due in large part to its location immediately north of Austin coupled with Austin's rapid expansion northward; Austin's city limits cross into Williamson County. Most of the growth has been residential, but also large employers, such as Dell's international headquarters, have changed Williamson County from just a bedroom community into a more vibrant community where its citizens can live and work in the same general vicinity. This has transformed the county over recent years into a dynamic, self-sustaining community with less dependency on Austin. Major retail and commercial developments began appearing from 1999 to present, including the Rivery in Georgetown, and the Premium Outlet Mall, the IKEA-area retail, and the La Frontera mixed-use center in Round Rock. Health care and higher education have both become major factors in the growth of Williamson County, as well. Two new colleges and two new hospitals have opened within the last five years. Another significant factor has been the opening in of the North Loop 1 toll road and Texas State Highway 45 toll road, which have made a major difference in accessibility between Williamson County and Austin. According to the U.S. Census Bureau, the county has a total area of 1,134 square miles (2,940 km2), of which 1,118 square miles (2,900 km2) are land and 16 square miles (41 km2) (1.4%) are covered by water. The area is divided into two regions by the Balcones Escarpment, which runs through the center from north to south along a line from Jarrell to Georgetown to Round Rock. The western half of the county is an extension of the Western Plains and is considered to be within the eastern fringes of Texas Hill Country; it has an average elevation of 850 feet (260 m). It features undulating, hilly brushland with an abundance of Texas live oak, prickly pear cactus, and karst topography. The eastern region of the county is part of the Coastal Plains and is flat to gently rolling with an average elevation of 600 feet (180 m). It consists of flatter land, with dark clay and rich, fertile soils for agriculture, but is quickly being developed as the county's population continues to increase and expand out. Williamson County is drained in the center and south by the San Gabriel River, which is the only river in the county, and in the north by creeks that run into the Lampasas and Little Rivers north of the county line. The eastern portion of Williamson County lies within the low-lying prairie areas east of the Balcones Escarpment (the escarpment is also known locally as the Balcones Fault) although it is not an active fault. It begins a piedmont, a foot-friendly fall line of slightly sloping land downward to the coastal area, an area made up of the Blackland Prairie consisting of rich, fertile, clay-like soils, where the land is still used for agriculture - growing cotton and other crops and raising cattle. These prairie lands essentially run from Williamson County to the Gulf Coast, and have a rich heritage of being farmed by German, Polish, and other settlers. West of the escarpment is the beginning of the "upland" Texas Hill Country, characterized by rocky terrain with thin layers of soil lying on top of limestone. Some ranching occurs in the uplands, but mostly it has been the target of residential development because of the rolling terrain, vistas, hardwood trees, abundant wildlife, and rivers and streams (the same reason that early Indians camped in this area). The Hill County areas are characterized by their porous "vugular" (honeycombed) rock where rain water slowly percolates down to replenish the underground Edwards Aquifer. For that reason, development restrictions are in place and several endangered species are being protected by the US Fish and Wildlife Service. Interstate 35, the main artery of Williamson County, runs along the fault line dividing the two distinct regions. Balcones Canyonlands National Wildlife Refuge is located in the Texas Hill Country to the northwest of Austin, including parts of western Williamson County. The refuge was formed in 1992 to conserve habitat for two endangered songbirds - the golden-cheeked warbler and the black-capped vireo and to preserve Texas Hill Country habitat for numerous other wildlife species. The refuge augments a similarly named preserve in Austin called the Balcones Canyonlands Preserve. The vegetation found in the Hill Country includes various oaks, elms, and Ashe juniper trees (often referred to as "cedar" in Texas). The endangered golden-cheeked warbler and black-capped vireo depend on different successional stages of this vegetation. Both of these birds nest in the Edwards Plateau, the warbler exclusively. Some protected areas are open to visitors, such as the Berry Springs Park. As of the census of 2010, 422,679 people, 152,606 households, and 111,514 families resided in the county. The population density was 373 people per square mile (144/km2). The 162,773 housing units averaged 144 per square mile (55/km2). The racial makeup of the county was 80.9% White, 7.1% African American, 1.3% Native American, 5.8% Asian, 0.3% Pacific Islander, 6.9% from other races, and 3.2% from two or more races. About 23.2% of the population was Hispanic or Latino of any race. Of the 111,514 households, 39.1% had children under the age of 18 living with them, 57.9% were married couples living together, 10.8% had a female householder with no husband present, and 26.9% were not families. Around 21.2% of all households were made up of individuals, and 17.4% had someone living alone who was 65 years of age or older. The average household size was 2.74 and the average family size was 3.20. In the county, the population was distributed as 28.7% under the age of 18, 11.9% from 15 to 24, 31.6% from 25 to 44, 23.2% from 45 to 64, and 8.9% who were 65 years of age or older. The median age was 34 years. The median income for a household in the county was $60,642, and for a family was $66,208. Males had a median income of $43,471 versus $30,558 for females. The per capita income for the county was $24,547. About 3.40% of families and 4.80% of the population were below the poverty line, including 5.40% of those under age 18 and 5.90% of those age 65 or over. The Commissioners Court is the overall governing and management body of Williamson County, and is responsible for all budgetary decisions and setting the tax rate each year. Among their duties is administration of all the business of the county, including the building and maintenance of county roads and bridges. The use of a commissioners court as the governing body of county government is used in several US states, including Texas. The principal functions of the commissioners' court are legislative and executive. Although referred to as a court, commissioners' courts generally exercise only limited judicial powers. The Commissioners Court consists of five members. The county judge presides as chairman over the court, and is elected every four years by all voters in the county. Four commissioners are elected by single-member precincts every four years. Beginning in 2017, Precinct 1 will be represented by Democrat Terry Cook; the remaining members of the court are Republicans. In recent decades, Williamson County has been a strongly Republican county. Before the 2018 elections, every federal and state elected official from the county was a Republican. Williamson County is wholly located in Texas's 31st U.S. Congressional District, which is represented by John Carter (R). All of Williamson County is within Texas Senate District 5, and is represented by State Senator Charles Schwertner (R). Williamson County includes three Texas House of Representatives Districts: 20, 52, and 136. District 20 is represented by Republican Terry Wilson, District 52 by Democrat James Talarico, and District 136 by Democrat John Bucy. Williamson County was traditionally a very solidly Democratic county. For example, in 1976, voters in Williamson County voted for President Jimmy Carter by a higher percentage (55%) than did voters in Travis County (52%). In 1980, however, the county swung over dramatically to support Ronald Reagan, giving him 56% of the vote, almost equal to Carter's 1976 total. Since then, the county has become increasingly Republican, taking on a character similar to other suburban counties in Texas. The Republican trend grew to where by 2004, President George W. Bush won 68% of the vote in Williamson County. John McCain received 55% of the vote to Barack Obama's 42% in the 2008 election. In 2012, Republican Mitt Romney defeated President Obama by a total of 59% to 38%. In 2016, Donald Trump beat Hillary Clinton 51%-41%. Also, election turnout reflects the tremendous growth of Williamson County. In 1960, only 7,800 votes were cast, while in 2012, over 163,000 votes were cast. One of the most significant growth factors of modern-day Williamson County is the location of a new Sun City community in Georgetown. 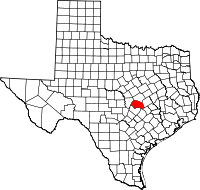 Opened in June 1995, and originally named "Sun City Georgetown", Sun City Texas is a 5,300-acre (21-km2) age-restricted community located in Georgetown, about 10 miles (16 km) west of IH-35 on Andice Road (RR 2338). It is part of the chain of Sun City communities started by the Del Webb Corporation (now a division of Pulte Homes). Residency is restricted to persons over age 55 (at least one person in a couple has to be 55 or older) and the community is generally oriented toward retirees. Sun City Texas pool at one of several recreation centers. As originally planned the project would double the size of Georgetown's population. Sun City Texas is made up mostly of single-family dwellings, but also has duplexes. The Sun City project includes three golf courses (Legacy Hills, White Wing, and Cowan Creek). Although the community attracts residents from all over, most come from within Texas to stay close to their original homes. Vocal opposition to the project has occurred at times, especially at the start during the zoning process, with arguments against the size of the community, its effect on Georgetown as a family-oriented town, concerns about the costs of providing city utilities, and concern about lowered city and Williamson County property taxes, which are fixed for retirees under Texas law, and the disproportionate effect of city voting. By and large, though, the community has been welcomed and well-accepted into the Georgetown populace. In the 2008 city elections, for example, two residents of Sun City were the only two candidates for mayor of Georgetown. They also were both formerly elected city council members. Williamson County was an agrarian community for most of the 19th and early 20th centuries. The Chisholm Trail, a cattle trail that led from Texas to the railcenters in Kansas and Missouri, crossed through the both Round Rock and Georgetown. Cotton was the dominant crop in the area between the 1880s and the 1920s, and Williamson County was the top producer of cotton in Texas. Primarily to transport bales of cotton, the county was served by two national railroads, the International-Great Northern Railroad, which eventually was merged into the Missouri Pacific, and the Missouri–Kansas–Texas Railroad. The town of Taylor in eastern Williamson County became the primary center for cotton production, cotton ginning, and compressing the cotton into bales to transport by rail. Other agriculture activities, farming and dairy were also a part of rural Williamson County east of the Balcones fault, and ranching occurred to the west in the Hill Country area. Both gradually gave way to more modern business, services, and retail as the overall area begin to become more urban. However, cattle ranching is still a major business in some areas of the county, and cotton is still a significant crop east toward Hutto and Taylor. Williamson County's only "full-service" hotel, with ballrooms and dining and executive meeting rooms, is the Austin North Marriott located in the La Frontera portion of Round Rock. The largest employer in Williamson County at one time was Dell Computer Corp, located in Round Rock, employing roughly 16,000 exployees. Retail and health care (including St. David's Hospital, Scott & White, Seton Medical Center Williamson hospital (a level II certified trauma center, and the A&M Health Science Center that opened in early 2010) are among the area's largest employers. Other than Dell, retail is the second-most significant business group in the county. The new IKEA store and Premium Outlet Mall in Round Rock, as well as those located in the La Frontera mixed-use project in Round Rock are significant to the county. Wolf Ranch and The Rivery are also major retail centers located in Georgetown. In addition, higher education has a large positive effect on the county with the opening of the Texas State University Campus in Round Rock and the new Austin Community College campus which opened in 2010. The Round Rock campus is the single largest campus in the ACC system, providing two-year degrees and training in the high-tech sector, nursing, and other specialties. The current courthouse, built in 1911, is an example of Neoclassical Revival architecture.| The courthouse has had a tumultuous past, surviving three major renovations and many modifications, including the demolition of its key architectural features in 1966. With the assistance of the Texas Historical Commission and preservation-minded county citizens and officials, the courthouse was returned to its original 1911 state during a major 2006–2007 renovation, once again becoming a focal point of the county. The stars on the flag surrounding the state of Texas represent the 33 viable communities identified by Clara Stearns Scarbrough in her 1973 book, Land of Good Water. In 1970, these communities ranged in population from 20 people in Norman's Crossing to more than 10,000 residents in Taylor. Establishing how many communities exist in Williamson County today is difficult, because the determination of "community" is subjective and without set criteria. However, in Williamson County in 2004, 11 towns had populations of over 1,000 people, and seven towns had populations above 5,000. Austin Community College also purchased a site in Leander, Texas in 2010 for an additional future Williamson County campus. The newspapers that serve Williamson County include the Round Rock Leader, Williamson County Sun (Georgetown), Taylor Press, Hutto News, Hill Country News (Leander), Liberty Hill Independent, and Tribune-Progress (Bartlett). In 2005 Community Impact Newspaper was founded. The Austin American-Statesman also has significant coverage in Williamson County. Nolan Ryan is a retired Major League Baseball pitcher and current president and majority owner of the Texas Rangers. Ryan played in a major league record 27 seasons for the New York Mets, California Angels, Houston Astros, and Texas Rangers, from 1966 to 1993. He was inducted into the Baseball Hall of Fame in 1999. Sam Bass (1851–1878), outlaw and train robber, was killed in a famous shootout in Round Rock in 1878. The shootout is re-enacted once a year as part of the Old Settlers Day celebration in Round Rock. King Fisher (1854- March 11, 1884) was a Texas rancher and gunfighter who lived in Williamson County during his boyhood. Dan Moody, a native of Taylor, was the 30th Governor of Texas from 1927 to 1931; he is remembered as a reformer and an opponent of the Ku Klux Klan and as the district attorney for Williamson County. Paul Womack, judge of the Texas Court of Criminal Appeals, 1997-2015, was as assistant district attorney in Williamson County, 1987-1997, and resident of Georgetown. The television show Kevin (Probably) Saves the World is set in Williamson County. Williamson County is depicted in the Coen Brothers movie Blood Simple. The 1996 film Michael (A Nora Ephron film) was shot principally in Georgetown and in and around Williamson County. The Texas Chain Saw Massacre, original 1974 version, primary filming occurred at a dilapidated farmhouse on the site of what is now La Frontera. In 1993, the house was moved to Kingsland, Texas, and restored to become a restaurant at The Antlers Hotel. ^ "WILLIAMSON, ROBERT MCALPIN [THREE LEGGED WILLIE]". tshaonline.org. June 15, 2010. Archived from the original on May 9, 2018. Retrieved May 9, 2018. ^ "Austin-Round Rock, Texas MSA". The Milken Institute. Archived from the original on July 21, 2011. ^ "Handbook of Texas Online, "Gault Site" entry". June 15, 2010. Archived from the original on July 10, 2011. Retrieved July 18, 2010. ^ Thompson, Karen R.; Jane H. Digesualado. Historical Round Rock Texas. Austin, Texas: Nortex Press (Eakin Publications). pp. 4, 7. ^ a b c d MARK, ODINTZ, (June 15, 2010). "WILLIAMSON COUNTY". tshaonline.org. Archived from the original on May 9, 2018. Retrieved May 9, 2018. ^ "Significant Weather Events of the 1900s". National Weather Service. Archived from the original on May 15, 2008. Retrieved March 22, 2009. ^ "Major and Catastrophic Storms and Floods in Texas". United States Geological Survey. Archived from the original on May 11, 2009. Retrieved March 22, 2009. ^ Jordan, Terry G. "Hill Country". Handbook of Texas Online. Archived from the original on November 2, 2010. Retrieved November 7, 2009. ^ United States Fish and Wildlife Service. "Overview". Balcones Canyonlands National Wildlife Refuge. Archived from the original on May 11, 2009. Retrieved March 21, 2010. ^ U.S. Senate, Committee on Appropriations. 2006. Prepared statement of Friends of Balcones Canyonlands National Wildlife Refuge. Senate Hearings, Department of the Interior and Related Agencies Appropriations, HR 2361, pp. 174–175. ^ United States Fish and Wildlife Service. "Welcome". Balcones Canyonlands National Wildlife Refuge. Archived from the original on March 8, 2010. Retrieved March 20, 2010. ^ Barrios, Jennifer (September 30, 2004). "Grant will help creepier residents. $2.35 million to save beetles, spiders and other endangered species". Austin American-Statesman. p. A1. ^ Doolittle, David (October 23, 2008). "Plan to protect species gets OK; U.S. Fish & Wildlife Service gives approval". Austin American-Statesman. ^ Texas Almanac: City Population History from 1850–2000 Archived September 16, 2012, at the Wayback Machine. Texas Almanac. Retrieved June 20, 2014. ^ "Election Results". apps.wilco.org. Archived from the original on April 24, 2017. Retrieved November 9, 2016. ^ Leip, David. "Dave Leip's Atlas of U.S. Presidential Elections". uselectionatlas.org. Archived from the original on March 23, 2018. Retrieved May 9, 2018. ^ Novak, Shonda. "Builders Pulte, Centex to combine in deal with national significance: Merger might be sign of industry rebound". Austin American-Statesman: B–07. ^ a b Ward, Pamela (December 29, 1996). "On course for a grand opening in sun city". Austin American-Statesman: B–1. Retrieved July 18, 2010. ^ "Del". Archived from the original on June 18, 2012. ^ Banta, Bob (April 10, 2008). "Mayoral hopefuls let their work talk". Austin American-Statesman. pp. W–01. ^ McLemore, Andrew (August 15, 2010). "Cotton County". Williamson County Sun. ^ "THE COURTHOUSE OF WILLIAMSON COUNTY, Georgetown, Texas" (PDF). williamson-county-historical-commission.org. Archived (PDF) from the original on March 4, 2016. Retrieved May 9, 2018. ^ "Plans revealed for Austin Community College." Archived September 17, 2008, at the Wayback Machine Austin Business Journal, Austin, Texas, September 3, 2008. Retrieved July 7, 2010. ^ "Plans revealed for Austin Community College." Archived September 17, 2008, at the Wayback Machine Austin Business Journal, Austin, Texas, September 3, 2008. Retrieved July 2, 2010. ^ Trollinger, Ben. Cox to purchase Round Rock Leader, The Williamson County Sun, October 18, 2006. Retrieved July 16, 2010. ^ "Community Impact Newspaper, About Us". JG Media. Archived from the original on March 26, 2010. Retrieved July 16, 2010. ^ "Rates and Circulation". Austin American Statesman. Archived from the original on July 3, 2012. ^ "Paul Womack's Biography". Project Vote Smart. Archived from the original on December 18, 2014. Retrieved December 17, 2014. ^ "The Antlers". Archived from the original on July 11, 2013. ^ Pack, MM (October 23, 2003). "The Killing Fields: A culinary history of 'The Texas Chainsaw Massacre' farmhouse". The Austin Chronicle. Archived from the original on January 5, 2014. Retrieved February 2, 2011. Wikimedia Commons has media related to Williamson County, Texas. Robert M. Williamson's entry in the Biographical Encyclopedia of Texas hosted by the Portal to Texas History.